Who are the Industry’s ‘20 Most Admired’? 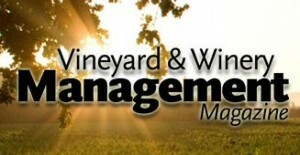 This is a guest post by Tina Caputo, Editor-in-Chief, Vineyard & Winery Management – a 2013 Wine Tourism Conference partner. 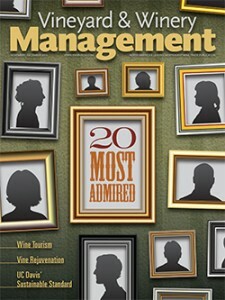 We’re really excited about the cover feature for the November-December 2013 issue of Vineyard & Winery Management (V&WM) magazine, because it recognizes the “20 Most Admired People in the North American Wine Industry.” Among the deserving folks on the list are winemakers, grapegrowers, educators, media members, and other industry professionals. The list was compiled by VWM editors – yours truly and columns editor Linda Murphy (keynote speaker at this year’s Wine Tourism Conference) — with the input of a judging panel comprised of winemakers, grapegrowers, wine writers, educators, buyers, sommeliers and consultants across the country. Panelists were asked to nominate their industry heroes, then given a list of 50 finalists and asked to vote for their top candidates. Narrowing down the list from nearly 200 to just 20 wasn’t an easy task! Ours isn’t a list of the most powerful or influential people in the wine business, although there are certainly people on our list who fit those descriptions. We thought it would be more interesting to ask people who they admire, because it opens up a discussion about the traits and actions that inspire esteem. We often admire people for their success, but factors like vision and integrity also come into play. When the final votes were tallied, 20 nominees – diverse in their backgrounds and accomplishments – rose to the top. Because no individual person received significantly more votes than the others, V&WM chose to list the winners in alphabetical, rather than numerical, order. To read the full story, including profiles of the award winners, visit http://www.vwmmedia.com/magazine/current_issue.asp.